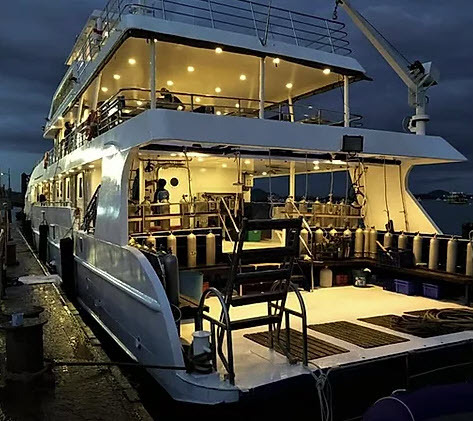 MV Deep Andaman Queen is a very popular luxury scuba diving liveaboard boat that sails to the best dive sites of Thailand, and sometimes into Burma’s Mergui Archipelago. All cabins have private en suite bathrooms & air conditioning. 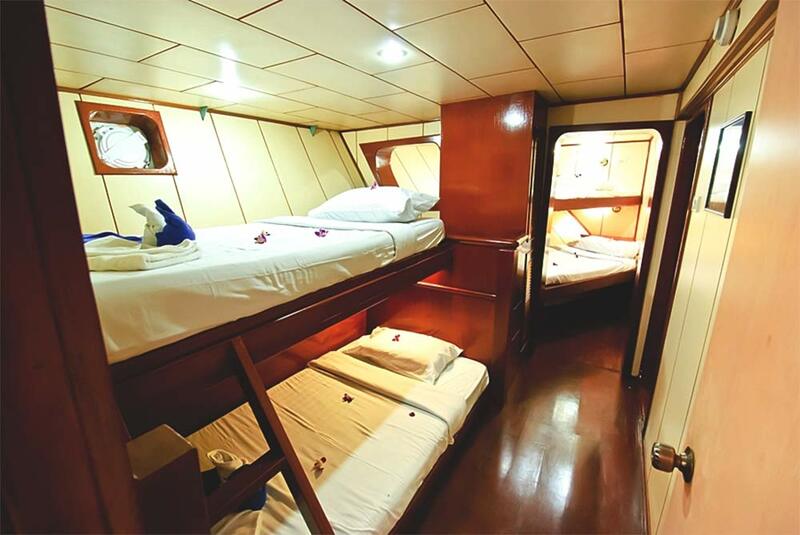 There are several cabin types to choose from, including quad, triple, twin, double & master. 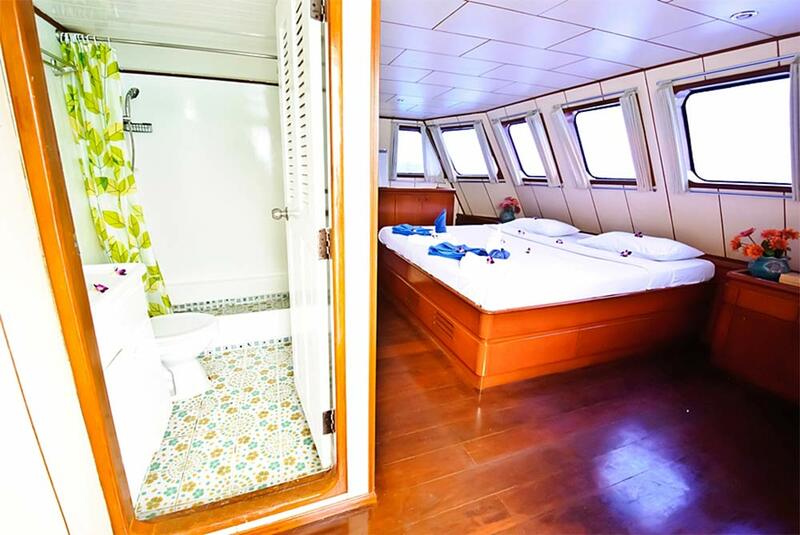 On the lower deck there are three 'standard' cabins, which have air conditioning and private bathrooms. These include a twin, a triple and one with four beds. 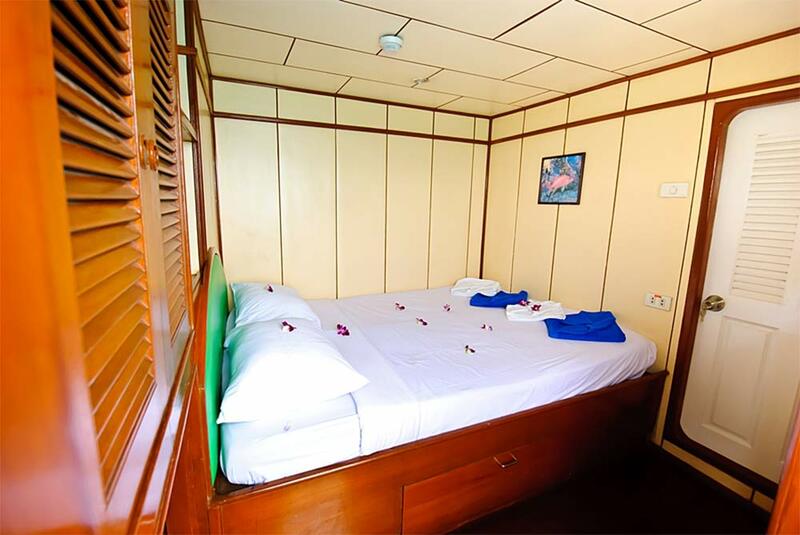 On the main deck Deep Andaman Queen has two deluxe twin cabins, three deluxe double cabins and a master cabin. All have large windows and doors which open ouot onto the deck. 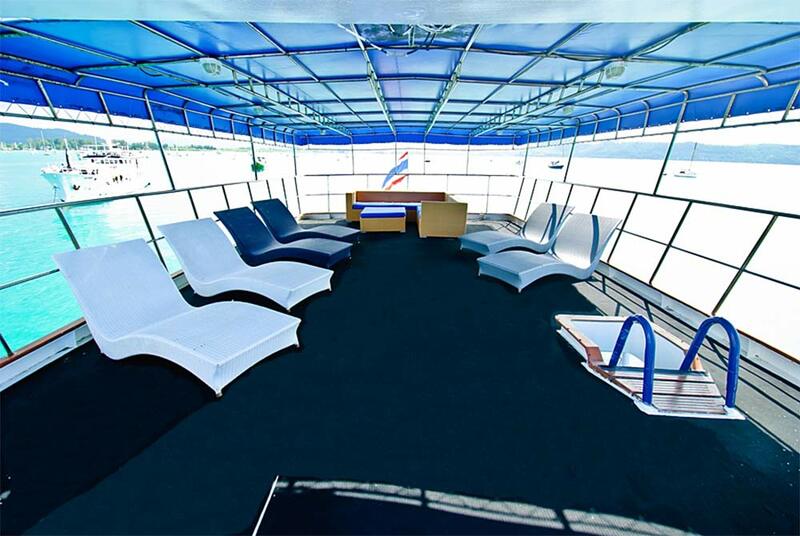 There are many wonderful things about this purpose-built diving boat, including its comfortable cabins, large communal areas and diving facitilities such as the huge diving deck. 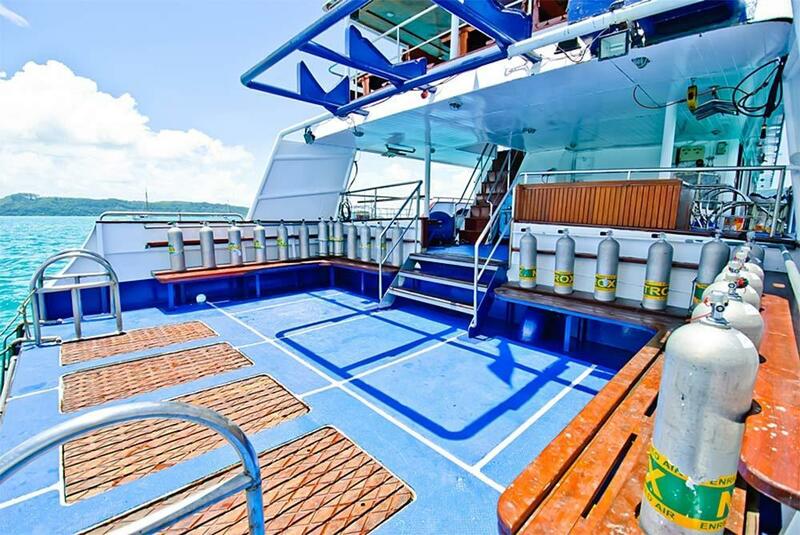 Starting with the dive deck & platform, which enables everyone to move around safely and easily before or after a dive. There are areas and rinse tanks for cleaning equipment & cameras, plus freshwater showers. Being purpose built means that everything is in the correct place, such as easy to access or out of the way. This includes the boat's compressor and Nitrox membrane system. For ease and convenience of scuba diving entry and exit, it is a dream-like boat. In addition, there are motorised tender dinghies to retrieve divers and transport guests to the pristine beaches which the Similans are famous for. 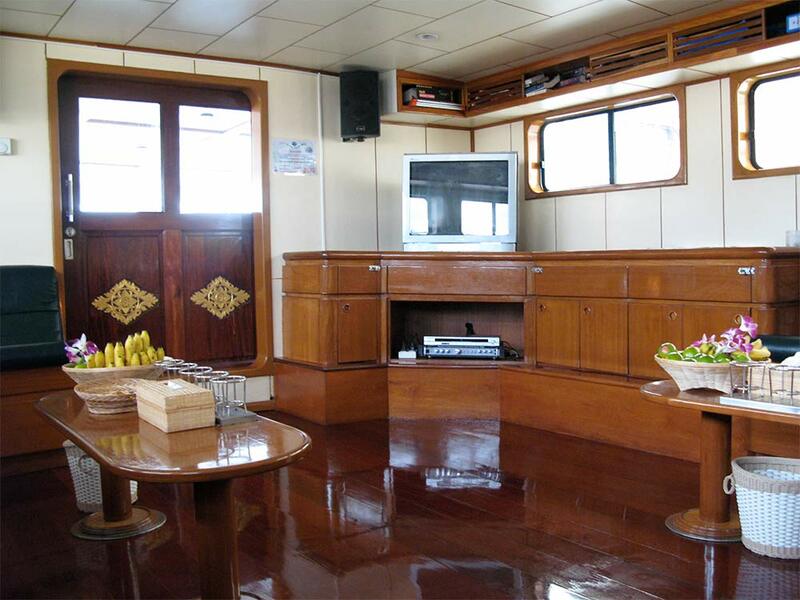 However, it’s not just the diving platform that makes a great liveaboard boat. Diving guests are only underwater for four up to hours per day, and non-diving guests are very welcome to join trips – at a reduced price. 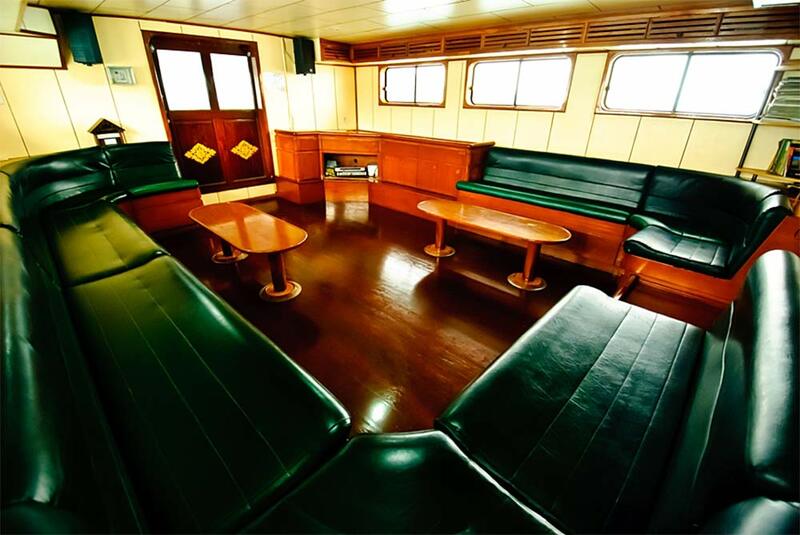 The other twenty hours of each day aboard Deep Andaman Queen can be spent in wood-lined air-conditioned cabins, on the sundeck or shaded lounge at the very top of the boat, in the saloon or the open air dining area at the back of the main deck. There’s always room to socialize or somewhere to get some privacy. Safety is the first and most-important thing for diving safaris to the Similan Islands, and the professional organization and on-board facilities and equipment enable Deep Andaman Queen to stand out among the others. However, from a guest’s point of view, the whole reason for going is to relax and/or have fun. 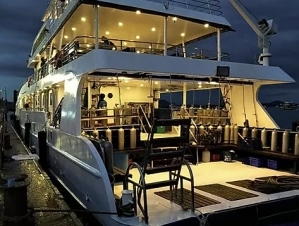 The crew and diving staff on Deep Andaman Queen pride themselves on ensuring that every guest, whatever diver level or cabin price paid, receives a professional & friendly service, and has lots of safe fun and/or relaxation. 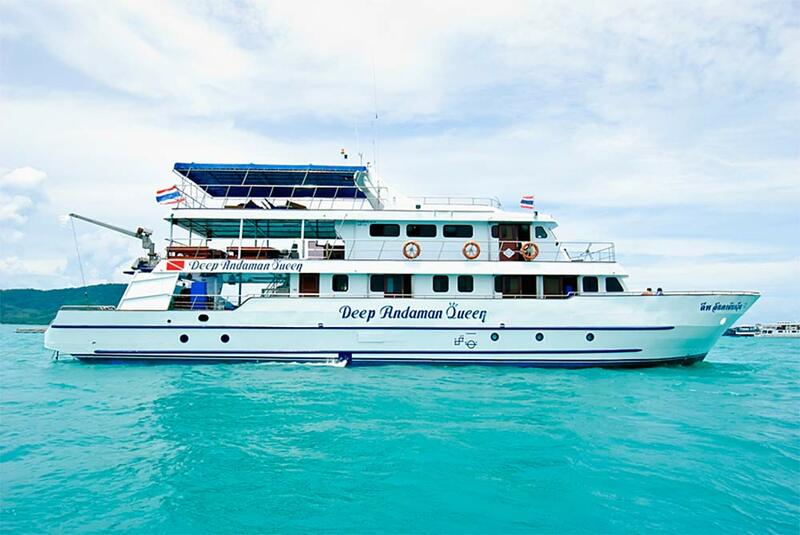 There are many reasons to choose Deep Andaman Queen for a Similan diving safari, including the new boat & its facilities, its staff, and the wonderful food to be enjoyed on board. 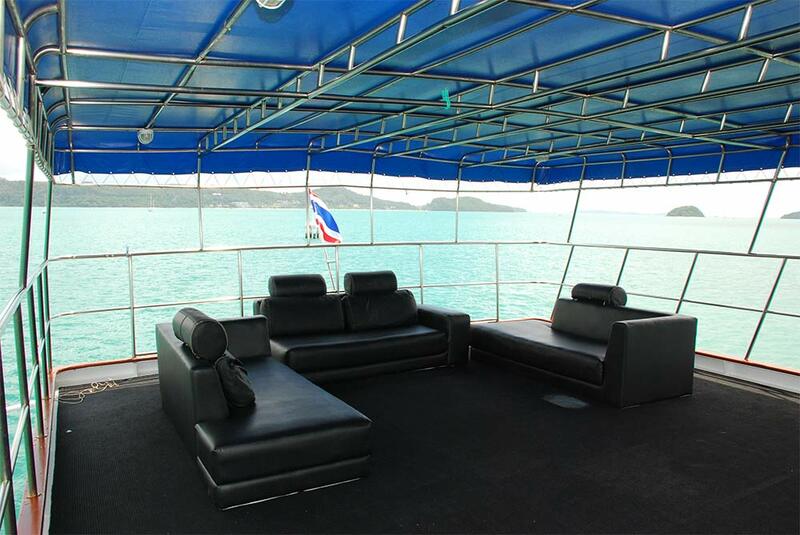 Scheduled transfers from around Phuket and Khao Lak are for free, and the boat receives no more than 21 guests on each trip, ensuring that there is plenty of space to enjoy every moment on board. The trips are usually four days & nights in length, with some five days & nights during peak-season periods. Once in a while, Deep Andaman Queen sails into Burma for week-long trips in the Mergui Archipelago. Deep Andaman Queen has several itineraries, as listed below. All trips have free scheduled pick ups from around Phuket and Khao Lak on departure day, as well as free drop offs after the trip. Trips leave in the evening on departure day, and return mid-late afternoon on return day. Please note that some other websites show the 4D/4N trips to be 5D/4N, but this is misleading because you're on board for less than 96 hours. Also the longer trips at Christmas and New Year should be shown as 5D/5N, not 6D/5N. The other websites try to make it look like you're getting a longer trip (which you're not) and if they advertise a 'per day' rate, it's easier to mislead you further. We show it as it is, and we are honest as possible. Length. 28.5 Metres ( 95 Ft ). Beam. 7 Metres ( 17 Ft ). Draft. 2.5 Metres ( 8 Ft ). Engines. 2 Hino Engines 2x 510 Hp. Generators. 2 Hino Generators Each With 50 Kw ( 220 V + 12 V ). Compressors. 2 Bauer Mariner Compressors 2x 190 Plum. Air. Enriched Air ( Nitrox ) Membrane. Electricity. 220 Volt Electricity 24 Hours A Day Available In All Cabins. Air - Conditioning. Air-conditioning System ( Hino ). Sun Deck. 60 Square Meter Sun Deck Area. Saloon. Large, Comfortable Air-conditioned Saloon. Entertainment. TV / DVD Player With A Library Of Films, CD / VCD/ MP3 Music System. Garmin Global Positioning System ( GPS ). 2x 4-metre Hard-hull Inflatable Dinghies With A 40hp Outboard Motors. Full-feature Medical First Aid Box + Emergency First Response Instructors On Board. Oxygen 1,500 Liters - All Guides Trained Oxygen Providers. Life Jackets In Each Cabin. 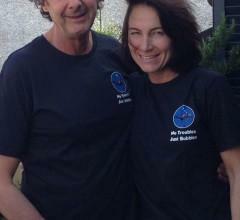 Affiliated Member With The Hyperbaric Chamber In Thailand. 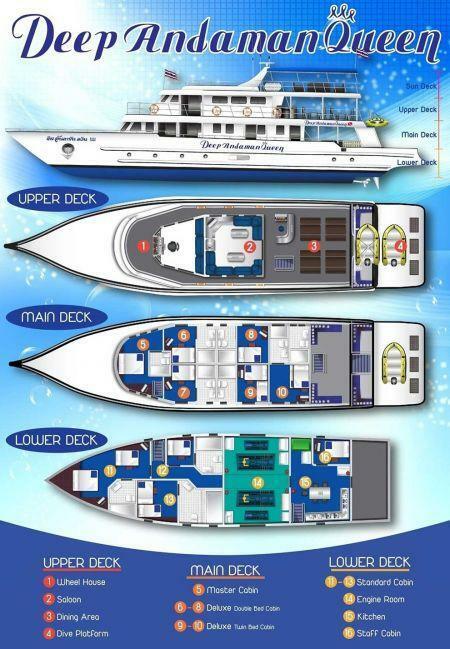 Dive Deck Dimensions: 6m X 8m. Dive Platform Dimensions: 2.5m X 7m. 2 Showers At The Stern. 2 Freshwater Buckets For Rinsing Cameras, Torches, And Other Gears. 12-litre Aluminum Cylinders With International Fittings. 15-litre Cylinders Are Available For Rent (with Advance Notice). 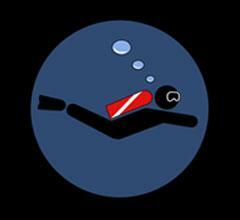 Scuba Pro And AquaLung Diving Equipment. DIN Adapters Are Available (please Let Us Know In Advance). There are several courses available on Deep Andaman Queen, in different languages. Normally, divers can choose a diving course after boarding, but it is much better to pre-book so that we can give you the latest information, availability and prepare the materials and staff in advance. There are free scheduled transfers on Deep Andaman Queen which are shared with other guests on the same trip. Crew was awesome, dive staff were very knowledgeable and conscious of the pros/cons with diving busy sites. Would dive off this boat again for sure. Great boat, great crew, great diving. You can’t go wrong. Also went from OW to AOW during this trip and appreciated Steve’s teaching and commitment to safety. He’s an amazing swimmer to see. First live aboard experience. Great time! Will repeat. 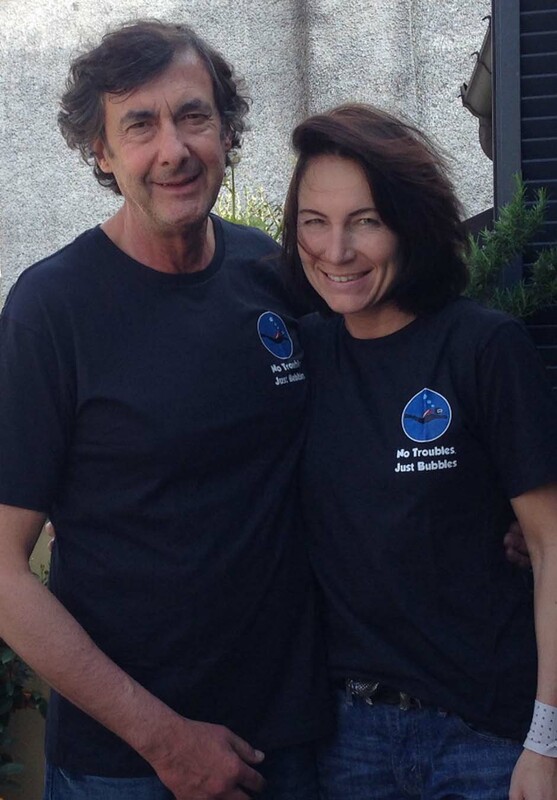 Crew exceptional & attentive, food delicious, dives fun & relaxed! Loved! Loved! Loved! Dive master Leanne was awesome and very professional. We had a great time on the boat. The crew is fantastic and you can't go wrong with their expertise. We would do it again! Prices include air-conditioned accommodation, all meals & soft drinks, and tanks, weights, belts & Divemaster guide services. The rates do not include National Marine Park fees (payable to local authorities), alcoholic drinks, or diving equipment rental (if required). New regulations for National Marine Park visitors means that everyone has to provide their passport details (such as a clear scan of the main page) so that we can buy your entry ticket. Due to limited supply of park entry tickets, this needs to be done as soon as possible. Weekends, holidays, & local logistics mean that it is often impossible to buy your ticket 1-2 days before your trip. We need as much time as possible. For Myanmar trips, we normally require 3-4 weeks to process the Myanmar diving permit. While some others may advertise these cruises as 5D/4N, 6D/5N & 8D/7N, the way that they are represented in our table above is probably more truthful. Guests board the boat in the early evening of the first day and disembark late afternoon 4, 5, or 7 days later. We feel that it is misleading to describe the trips as more than we have, even if it is true that the cruises span 5, 6, & 8 days respectively. Soft drinks are free, but beer & wine are charged at reasonable rates. Deep Andaman Queen souvenirs are also available on board.